We are solving problems basing on the concepts of vectors and its applications.Vector addition is different from scalar addition. Here we need to add taking not only its magnitude but also its direction. 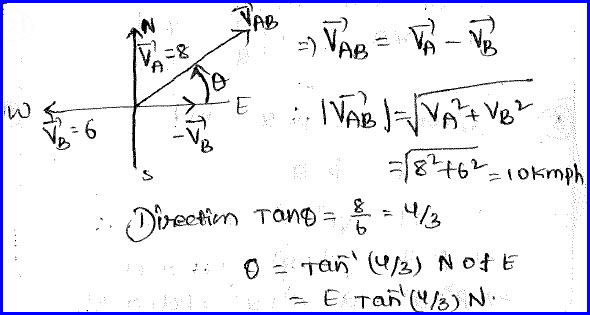 Thus we need to follow parallelogramlaw of vectors to find the resultant of the two vectors. Displacement, velocity are the simple examples of vectors and speed and distance are the simple examples of hte scalars. 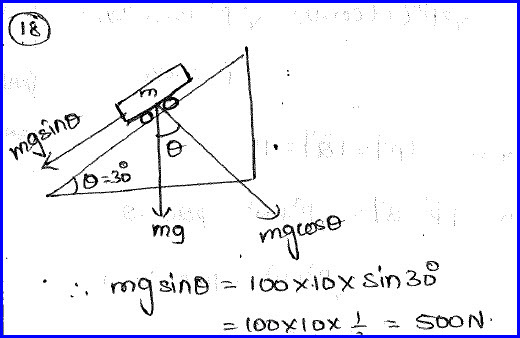 In the given problem a car is weighing 100 kg and it is kept on a slope and the angle of the slope is given to us in the problem. We need to know the component of the weight of the car parallel to the slope. The problem is as shown in the diagram below. We can resolve the vector into components. Each component is also a vector and it has specific direction. 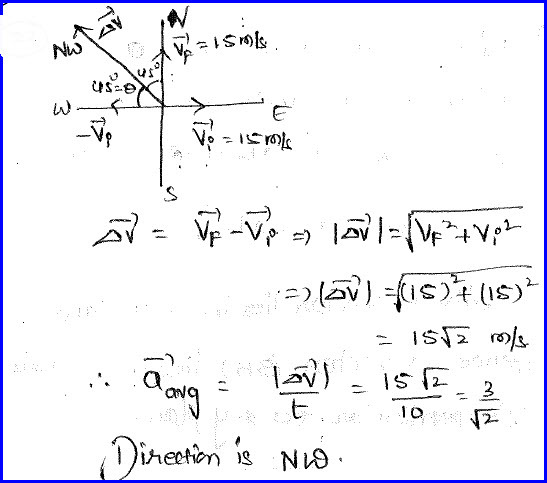 To identify the direction, we can multiply the component of the vector with unit vectors along X and Y direction. When we add both the components, we can get the original vector and we can find the magnitude and direction of the given vector basing on this concept. 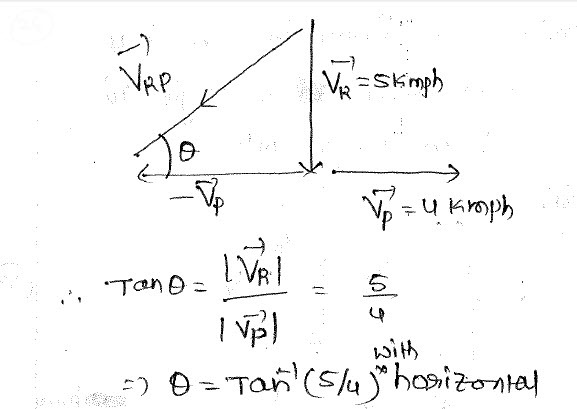 The problem is regarding relative velocity. It is the comparative velocity of one body with respect to the other. 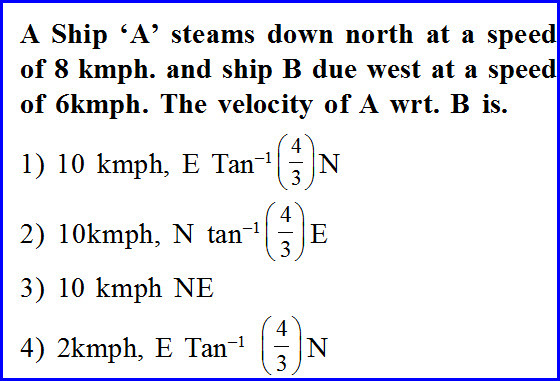 Two ships are moving with certain velocities and we need to find the relative velocity of with respect to the other. The problem is as shown in the diagram below. If two bodies are moving in the same direction, then the relative velocity is the difference of velocities of two bodies. We can find the magnitude and direction as shown in the diagram below. This problem is about finding average acceleration of the particle. It is first moving eastwards with a certain velocity and then it has changed its path towards north and continued moving with the same speed for 10 second. We need to find the average acceleration of the particle. The problem is as shown in the diagram below. Velocity of the particle along east can be expressed in terms of "i" component and velocity along north can be expressed in terms of "j" component of the vector. They are the unit vectors along X and Y axis. We can find the difference of the two vectors magnitude and by using the concept that acceleration is the rate of change of the velocity, we can solve the problem as shown below. 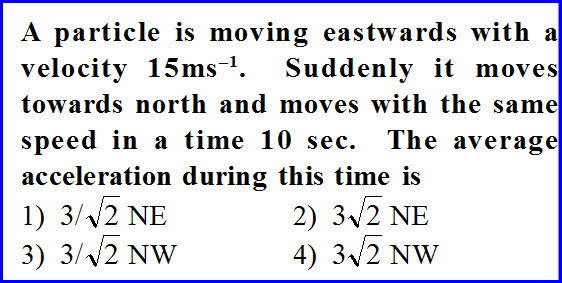 In this problem, a man in a car is moving with a speed known on a raining day. To protect himself from the rain, he has to hold the umbrella at an angle with the vertical. We need to find the velocity of the rain and the problem is as shown in the diagram below. We need to know the direction of the relative velocity of the rain with respect to man. It is the vector sum of the velocity of the rain with respect to ground and the velocity of the ground with respect to the man. We can draw the direction as shown below and hence, we can solve the problem. It is also a similar problem. 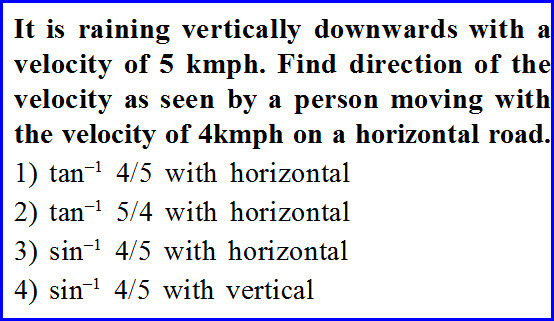 It is raining vertically with a known velocity and we need to know the direction in which a man see that rain when he is moving horizontally with a known speed. the problem is as shown int the diagram below. This problem is also solved in the similar way of the previous problem. 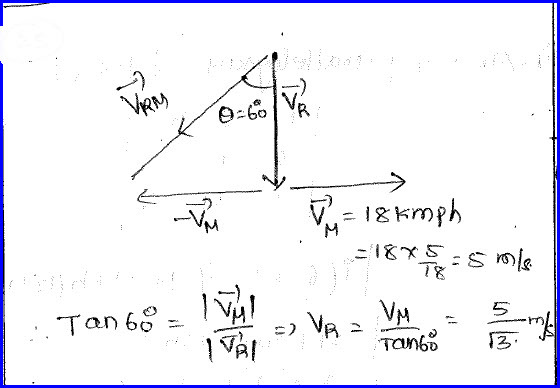 We can get the angle and hence the relative velocity as shown in the diagram below.